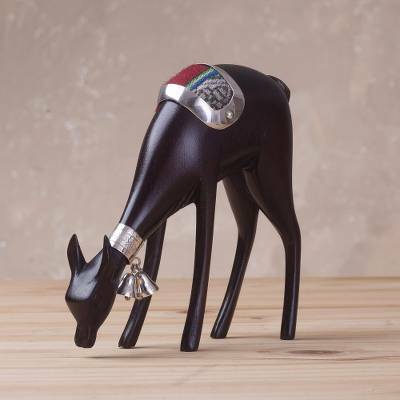 Sterling Silver and Mahogany Wood Deer Sculpture from Peru, "Deer of the Andes"
For Peruvian duo Fernando and Janeth, the deer is one of the most important and iconic members of Andean wildlife. An innocent, charming deer grazes in this sculpture, carved by hand of rich caoba wood. A sterling silver collar with bells circles the deer's neck, and a sterling saddle with a colorful acrylic weave rests on its back, resulting in this charming addition to your home.